Candles are a beautiful addition to a centerpiece, as long as you are careful when using flammable materials and the hot wax. 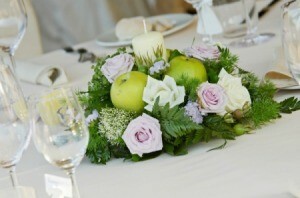 This is about centerpiece ideas using candles. Looking to make my own centerpieces for a September wedding. I am thinking something with candles. Any suggestions? Oh, I need 40 of them! Anyfeed back will be helpful. Congratulations on your Big Day!! I recently went to a wedding where the bride and groom scattered blue and clear glass votives with candles everywhere! There was one at each place setting, a few scattered on a mirror in the middle of the table with some loose flowers scattered around as well. They were also on the buffet table, the bar, the gift table, and even in the bathrooms. She said she got them bulk via mail order...and she let everyone take them home. It was simple but very pretty and the glow of the candles was gorgeous. For my wedding I took large glass bowls (found at the large craft supply stores) and filled them with Sea Shells and floating sea shell shaped candles. (I had a sea shell theme instead of a color theme.) For a little extra pizzazz I also put two white kissing fish in each bowl. In total I think I spent $8 on each arrangement. Since then many people have come to me with other ideas, like colored artist sand in the bottom and glass beads. Depends on your colors. If you are using fall colors, a simple column candle on a mirror tile, surrounded by fall leaves, real or artificial would be great. Mirrors at home improvement stores are cheaper than craft stores.